Barbed wire, also known as barb wire, first became popular in the American West as a means to separate and corral livestock. It provides an easy-to-construct physical barrier that works by threatening injury rather than being physically strong. Over the years, it has been developed for protection and warfare as well as for agriculture. 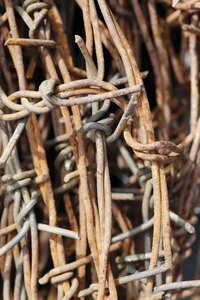 Depending on the manufacturer, barbed wire can have a different look and even style to the barb. In the last few decades, barbed wire has been used to create art from simple balls of wire to complex physical sculptures. Put on the safety goggles and leather work gloves. Grab one end of the barbed wire and bend it into a circle, using pliers if necessary. Use a cheap plastic ball as a guide for size and curves if you want a more uniform shape, or just wind it like a ball of twine. Bend the end around the wire of the loop and crimp it with pliers to secure it. Wrap the wire into a sphere, using pliers to help guide the shape. Continue doing this until the ball is the desired thickness. Snip off the remaining barbed wire, using wire cutters. Bend the end around one of the loops of wire and crimp it with pliers to secure it. Poke the ball with a blade -- if you used a plastic ball as a guide -- to deflate it and use tongs to pull its remains from the inside of the barbed wire ball. Use proper eye protection while making the barbed wire ball. Like all wire, barbed wire can whip around unexpectedly and strike the user. Use thick leather gloves when handling the barbed wire. The barbs can still puncture the skin, and if it is antique or used wire, dirt and bacteria on the barbs can cause an infection.